As a gardener, you always need to take care of your plants because you know you will never ensure the optimum growth of your plants without care. Pruning is one of the best processes that emphasize the growth of your plants. 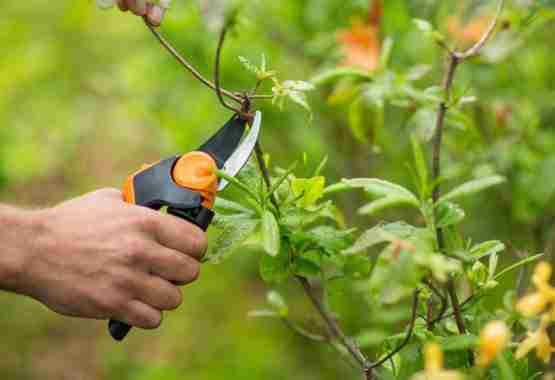 You can use the best garden tool sets for pruning your plants properly. Before that, you have to know the pruning techniques and also why you need to do this. Right? In a word, you need pruning of your plants to ensure healthy growth that emphasizes flowering and fruiting. We think these are your ultimate expectations. Here, we cover all the information that is needed to prune perfectly at a suitable time. Details are the below. When and Why to Prune Plants? How to Clean Your Pruning tools? First of all, we would like to tell you why you need to prune. You already know that you should prune the plants for optimum growth. But, there are other reasons that inspire you to prune. Maintaining shape: Sometimes you notice that some of the boughs cross the branches and as a result the shape of the plant becomes ugly. Finally, you need to prune to give a beautiful shape of the plant. Separating dead portion: If any parts of your plant are dead, you should remove that. Otherwise, it inhibits the growth of the plant. That may be the leaf, root, or branches. Removing diseased part: It is better to separate the diseased plant from the well-growing plans. If not possible, the best way is to pruning the diseased part. Always keep the eyes to the plants and ensure the plans are fully free from diseased. Well, you know why you need to prune, but it is the time to know when to prune? The perfect time of pruning is early summer, spring, and winter. But remember you should not go for pruning in the fall. It is very necessary for determining the best garden tool sets for pruning correctly. You know all tools haven’t the same function that is why you should choose the right tool for the relevant purposes. You should choose hand pruners to cut the bough that is thick up to 1 inch, but you should use the loppers when the thickness is about 2 inches. You cannot use the hand pruner to cut up to 2 inches because you can’t cut the item perfectly with comfort. On the other hand, if you need to maintain the shape of your plant such as round shape, sculpt shape then the hedge shear can help you a lot. It is designed to cut the leaf and small branches simultaneously from the outside. It will be best if you use the different tools to cut the living plants and dead or dying plants. Bypass pruner is recommended for cutting green, living plants on the other hand Anvil pruner is suitable for dead growth. This section is one of the most important parts of this content. Pruning is a good and necessary thing that you know. But it is essential to know how to prune perfectly or to specify the portions need to be pruned. When you go for shearing, make sure you are cutting the elevated portions to level with the adjacent part. But, you should be careful about how deeply you are cutting. Don’t cut the branches too deep from the outside because you are shearing to give a wonderful outlook. To maintain better growth of a mature tree, you may need to remove one more branch. But, you have to decide which branches are those. Whether it is a fruit tree or flowering tree, it always favors the branches that are positioned at 45 degrees to 60 degrees. You need to prune the branches which cross each other. The crossing branches inhibit the growth as well as look ugly also. But, be careful while cutting moderate or large size branches as it doesn’t affect of hit the mainstream, or other branches of the plant. That’s it. It is important to clean the pruning tools perfectly to keep them well functioning and higher longevity. Mix the mild amount of soap with warm water and mix the soap with water with a stirrer. Then wet the tools with soapy water and clean thoroughly with soft cloth or towel. After that wash the tools and wipe the water with a towel. Then allow the tools in open air to be dried completely. If you look the tools are not working properly as it becomes tight, then you can apply oil to keep it smooth performing. Remember again don’t store any tool while it is wet. You are ready to go for pruning the plants now. But, don’t go for pruning without knowing pruning techniques. All the info is equally useful for pruning such as the time of pruning, why to prune, and most importantly how to prune plants and you know all of these. Now you also know the benefits of pruning plants. Hopefully, you will come back on this platform again to know any information about gardening and to share your pruning experience and result with us. 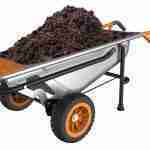 Worx Aerocart Wheelbarrow Review - Is It The Best Cart To Invest For? 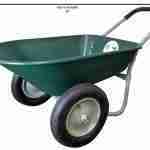 Marathon Dual-Wheel Wheelbarrow Review - Is This Worth Your Money?